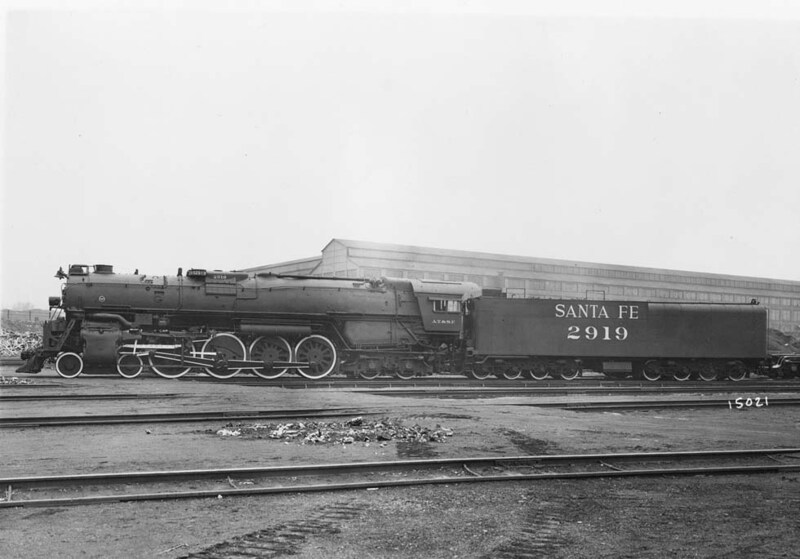 In 1892 ATSF, the "Santa Fe" started the California Limited Chicago - Los Angeles, with cars also from Saint Louis and for San Diego, from 1896 as an all-Pullman. On the mountain sections, huge Mallets were used. 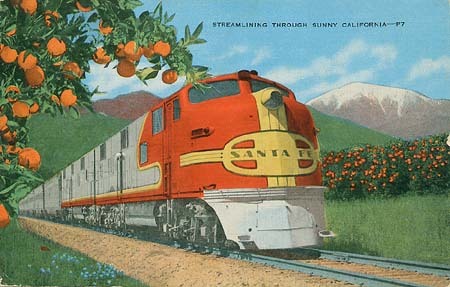 From 1911 once weekly also the exclusive "Santa Fe de-Luxe" did run. In 1926 once again an all-Pullman was introduced, the Chief. 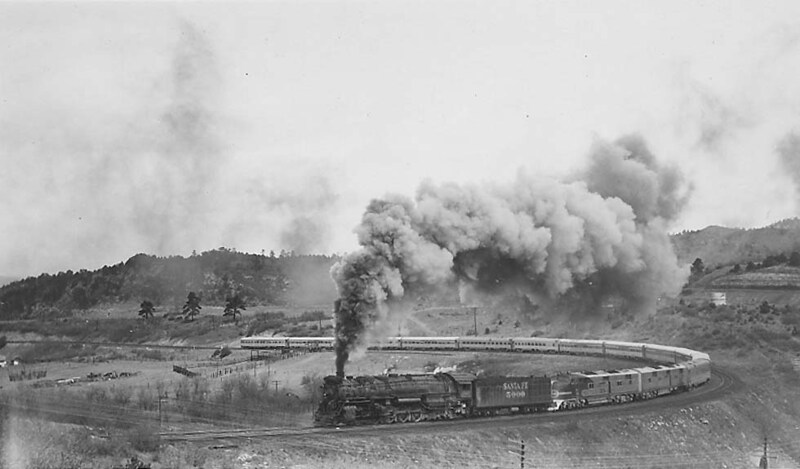 Later its mighty oil-fired 4-8-4s did run from Kansas City to L.A. without change of engine! 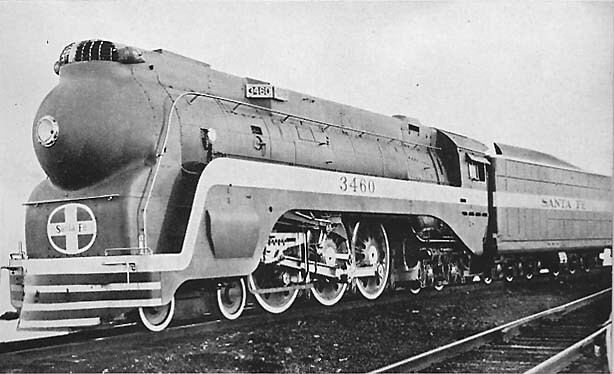 In the East the Hudsons hauled the Chief, one of them streamlined, nicknamed the "Blue Goose". With its wheel diameter of 2.14m it was capable of running at 200km/h or 125mph. All that was nothing compared to the sensational Super Chief or simply the "Super", as it was called. On May 12, 1936, three days before the competing "Cities", world's first diesel-hauled all-Pullman de-luxe started from Chicago to L.A., cutting 15 hours traveling time. But only in 1937 appeared the beautiful streamliner cars from Budd, designed by Cret, Harbeson, McDonald and Birdseye, and the nice streamlined E1 diesels, replacing "Mutt" and "Jeff". 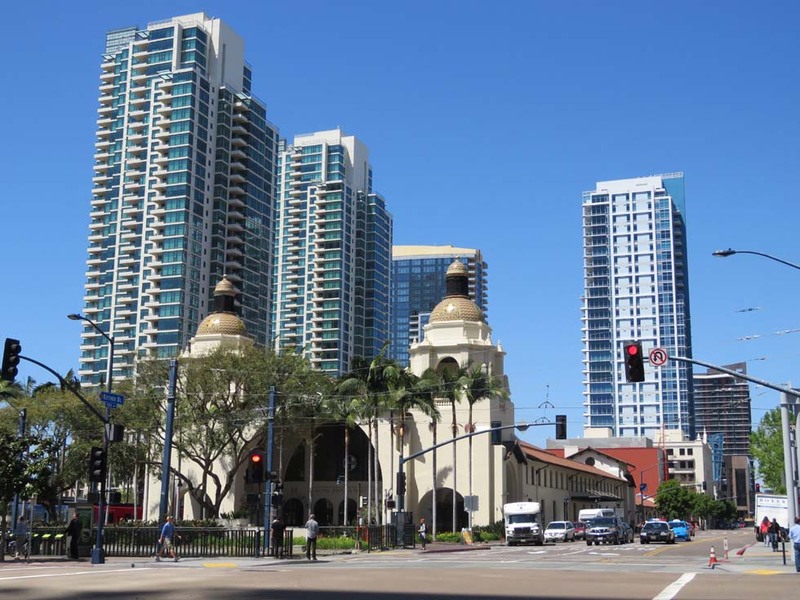 And the "Fred Harvey" restaurant offered things such as Malassol caviar, swordfish, salmon, roast beef, lamb steak ("extra thick"), lobster salad, Gruyere and Cheshire cheese. In 1938 a second train set, now built by Pullman, allowed two starts per week. On the Raton pass however, still a big 2-10-4 type steam engine had to help. In 1947 the F3 diesels (BoBo) replaced the E1, from 1948 additional Pullmans allowed a daily service and in 1951 came the "Pleasure Dome". Four F3 diesels with 12 cars still maintained the 39 ½ hours traveling time from Chicago to L.A. (whilst the slower Chief temporarily was hauled by Alco diesels). For the not quite so rich people in 1938 El Capitan was introduced, an "all-coach extra-fare streamliner" with 7 coaches and two E1 diesels, later F3, alternating with the "Super". 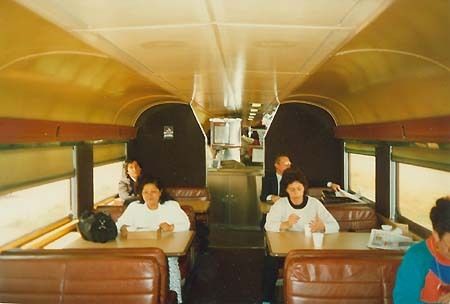 In 1956 appeared the revolutionary "Hi-Level" coaches. Four F3 engines now hauled the 12 cars. 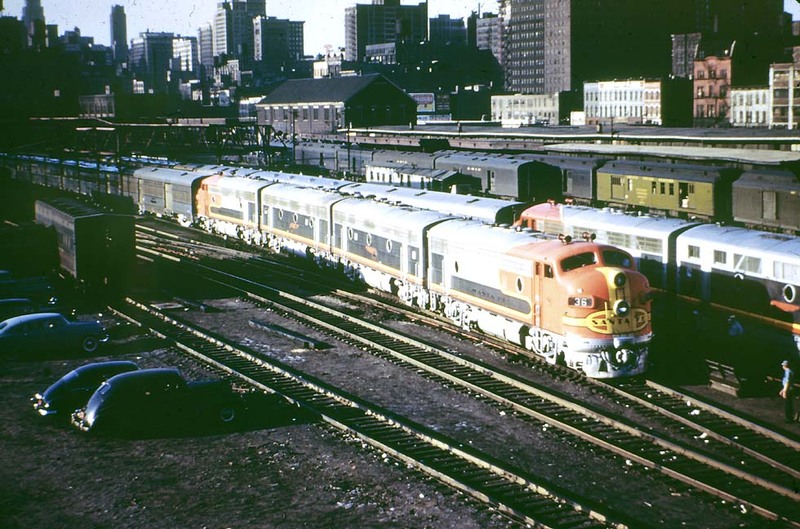 In 1968 the Super Chief was combined with El Capitan and the Chief disappeared. 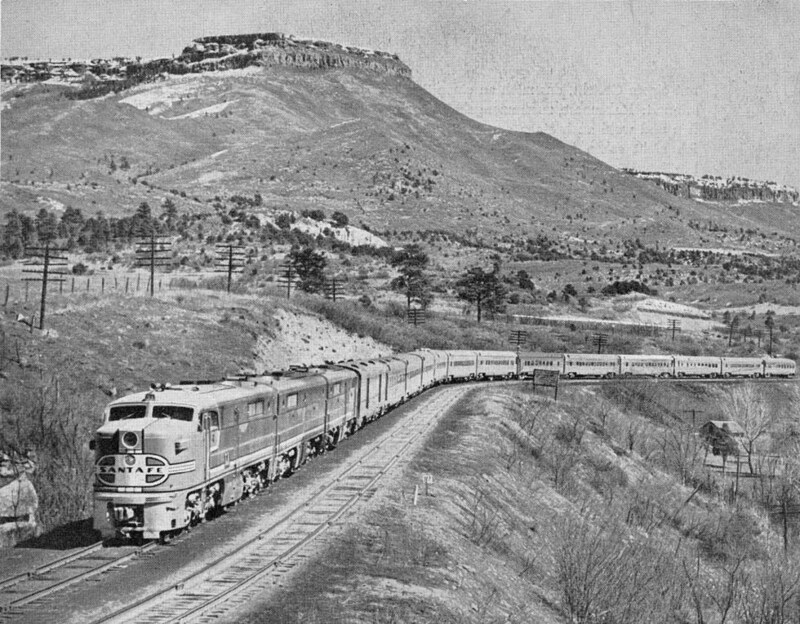 On April 30, 1970, ATSF stopped the trains, now being hauled by a pair of clumsy FP45 diesels. 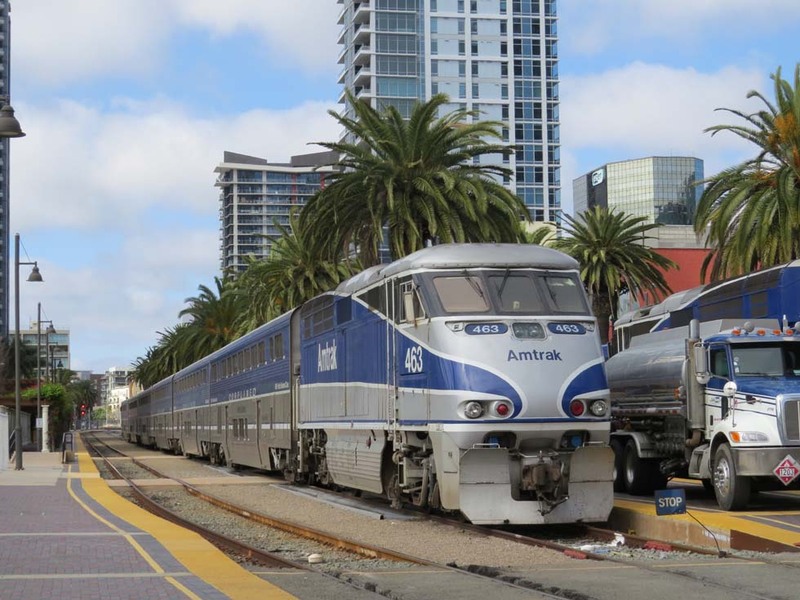 Amtrak resumed the service, but then ATSF forced to change the name. It became the South West Limited, then the South West Chief - later with the fantastic "Superliner" hi-level cars. 1 Sleeping Car 2635 ex UP New York (National Ltd) - Kansas City L.A.
1 Sleeping Car 6633 ex ACL New York (National Ltd) - Kansas City L.A. Colors: Amtrak cars stainless with blue/red ribbon, locomotives silver with ribbon, later silver/dark blue. Three locomotives when there were more than 13 cars. 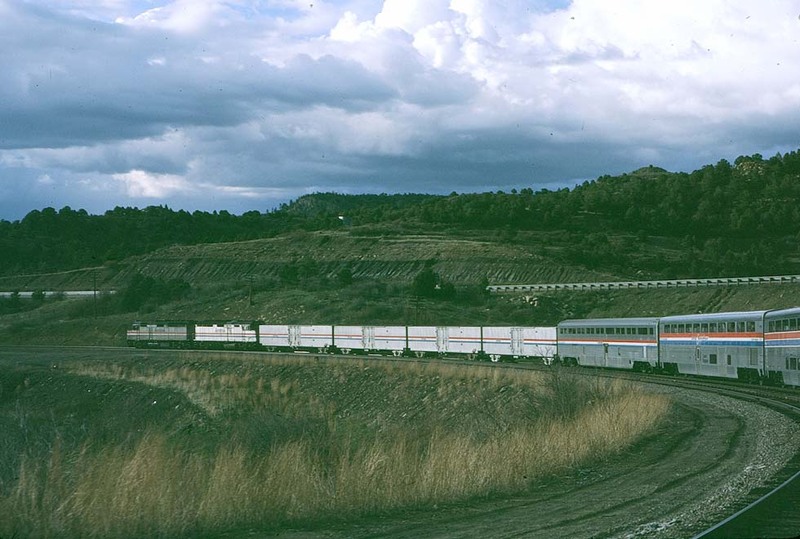 Towards 1998 F40PH were replaced by P42DC diesels, temporarily due to the number of mail cars up to 4 engines. 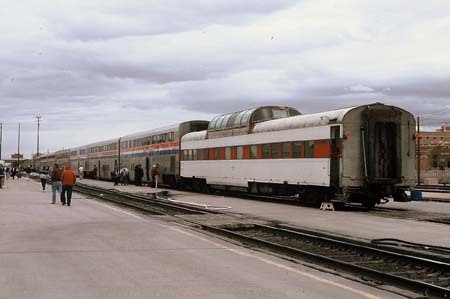 In 1996 Amtrak's Capitol Limited Washington - Chicago was equipped with Superliner cars and then temporarily it became combined with the South West Chief, connecting Washington with Los Angeles.